Jennifer E. Moore, Ph.D., R.N., Whitney P. Witt, Ph.D., M.P.H., and Anne Elixhauser, Ph.D.
Childbirth is the most prevalent reason for hospitalization in the United States.1,2 Of the 4.1 million hospital stays in 2009 involving childbirth, 91.3 percent of vaginal and 99.9 percent of cesarean section deliveries had at least one complicating condition.3 These conditions range in severity and may include those that are preexisting, such as mental health disorders; those that create risk factors, such as multiple gestation; and those that may lead to complications of care, such as an abnormality of fetal heart rate or rhythm. In the United States, childbirth accounts for about 10 percent of all maternal hospital stays and $12.4 billion in hospitalization costs for live births; it represents, in the aggregate, one of the most costly conditions for inpatient hospital care.4,5 The average cost of a vaginal birth in 2008 was $2,900 without complications and $3,800 with complications.2 The average cost of a cesarean section was $4,700 without complications and $6,500 with complications. This Statistical Brief presents data from the Healthcare Cost and Utilization Project (HCUP) Nationwide Inpatient Sample (NIS) on the source of payment for pregnancy and childbirth hospitalizations with complicating conditions versus without complicating conditions by mode of delivery in 2011. We examine stays for vaginal and cesarean section deliveries and compare rates of complicating conditions by expected payer type (Medicaid versus private insurance). All data are reported from the maternal perspective (i.e., reflecting the experience of the mother, not the newborn) among women who had a hospital delivery in 2011. Among the 3.6 million hospital stays involving childbirth in 2011, cesarean section deliveries were 11 percent more likely among women who were covered by private insurance than among women covered by Medicaid. Mean length of stay and mean hospital costs were similar by payer type. Among women who delivered by cesarean section and were covered by Medicaid, 94.6 percent of discharges included a complicating condition. Overall, for discharges among women with vaginal deliveries covered by private insurance, the rate of cases with complications increased with age (75.5 per 100 for adolescents younger than 15 years versus 83.3 per 100 for women aged 40-44 years). For vaginal deliveries, second-degree perineal laceration rates were higher among women with private insurance than Medicaid. Compared with women covered by Medicaid, women with private insurance were more likely to have a cesarean section delivery when complicating conditions that may impede vaginal delivery were present. All differences between estimates noted in the text and tables are statistically significant at the 0.05 level or better. Clinical significance was also considered for reporting and presentation. Table 1 reports select characteristics of vaginal and cesarean section deliveries for Medicaid versus private insurance in 2011. * Approximately 6 percent of childbirth stays were among women who were uninsured or covered by Medicare. Percentages do not total 100 because these data were not included. Cesarean section deliveries were more common among women with private insurance than among those covered by Medicaid. There were 3.6 million hospital stays involving childbirth among all ages of females who were covered by Medicaid or private insurance in 2011. More childbirth stays occurred among women with private insurance than among those covered by Medicaid (1.9 million versus 1.6 million stays). Cesarean section deliveries were 11 percent more likely among women with private insurance compared with women covered by Medicaid (35.0 percent versus 31.5 percent). Mean length of stay and mean hospital costs were similar by payer type. For both payer types, maternal stays for cesarean section deliveries were more than 1 day longer than stays for vaginal births. Mean costs were also higher for women with cesarean section deliveries, regardless of payer type. In aggregate, maternal stays for childbirth cost $15.1 billion among women who were covered by Medicaid and private insurance: $6.9 billion for Medicaid-covered stays and $8.3 billion for privately insured stays. Pregnant women with private insurance were older and more likely to have multiple gestation than women covered by Medicaid. On average, women with private insurance were 4 years older than those covered by Medicaid for both delivery types (29 years versus 25 years for vaginal births; 31 years versus 27 years for cesarean section deliveries). For both payer types, women with a cesarean section delivery were, on average, 2 years older than women with a vaginal birth. Women with private insurance were more likely to have multiple gestation than those covered by Medicaid (13.6 percent of women with private insurance versus 8.1 percent of women covered by Medicaid for vaginal births; 48.0 percent of women with private insurance versus 25.0 percent of women covered by Medicaid for cesarean section deliveries). Figure 1 presents the distribution of discharges with complicating conditions by payer type and delivery method. Figure 1. Percentage of stays with presence of complicating conditions, by payer and delivery method, 2011. Figure 1 is a bar chart showing the percentage of hospital stays involving childbirth with complicating conditions by delivery method for women covered by Medicaid versus private insurance. Vaginal delivery: Medicaid: 72.1, Private Insurance: 79.7. Cesarean section delivery: Medicaid: 94.6, Private Insurance: 93.6. Source: Agency for Healthcare Research and Quality (AHRQ), Center for Delivery, Organization, and Markets, Healthcare Cost and Utilization Project (HCUP), Nationwide Inpatient Sample (NIS), 2011. Complicating conditions were more commonly associated with cesarean section deliveries than vaginal births. Among patients covered by Medicaid, women with a cesarean section delivery were 31 percent more likely to have a complicating condition than those with a vaginal delivery (94.6 percent versus 72.1 percent). Among patients with private insurance, women with a cesarean section delivery were 17 percent more likely to have a complicating condition than those with a vaginal delivery (93.6 percent versus 79.9 percent). Complicating conditions differed by delivery type and payer. For vaginal deliveries, women with private insurance were more likely to have complicating conditions (79.7 percent) than those covered by Medicaid (72.1 percent). There were no meaningful differences in overall complication rates by payer for cesarean section deliveries. Table 2 shows the number and rate of complications among hospital childbirth stays by maternal age, payer, and delivery method. Note: Principal and secondary diagnoses were examined. Complicating conditions for vaginal births were more common among privately insured than Medicaid-covered deliveries, regardless of maternal age. Women in every age category who had vaginal births covered by private insurance experienced higher rates of complicating conditions than women covered by Medicaid. For example, among women aged 25-29 years with private insurance, 78.7 per 100 discharges had complications versus 70.6 per 100 discharges among those covered by Medicaid. For women with private insurance who had vaginal deliveries, the rate of complicating conditions generally increased with age (e.g., 75.5 complications per 100 for adolescents younger than 15 years to 83.3 per 100 for women aged 40-44 years). Mental disorders were more common for childbirth stays covered by Medicaid than private insurance. Mental disorders were among the top 10 most common complicating conditions for women covered by Medicaid (51 per 1,000 for vaginal births and 59 per 1,000 for cesarean section deliveries). In contrast, the rates of mental disorders among women with private insurance were 31 and 38 per 1,000 for vaginal and cesarean section deliveries, respectively (shown in Appendix). Anemia was more common for childbirth stays covered by Medicaid than private insurance. Rates of anemia were higher for women who were covered by Medicaid than for those with private insurance. Among vaginal delivery stays, anemia occurred in 127 per 1,000 Medicaid-covered discharges versus 73 per 1,000 privately insured discharges. Similarly, among stays for cesarean section deliveries, anemia occurred in 186 per 1,000 discharges covered by Medicaid versus 128 per 1,000 discharges covered by private insurance. For vaginal deliveries, second-degree perineal laceration rates were higher among women with private insurance than among women covered by Medicaid. Second-degree perineal laceration occurred at a rate of 314 per 1,000 privately insured discharges versus 178 per 1,000 Medicaid-covered discharges. Moreover, first- and second-degree perineal lacerations were the most common complicating conditions for vaginal deliveries among both payer types. 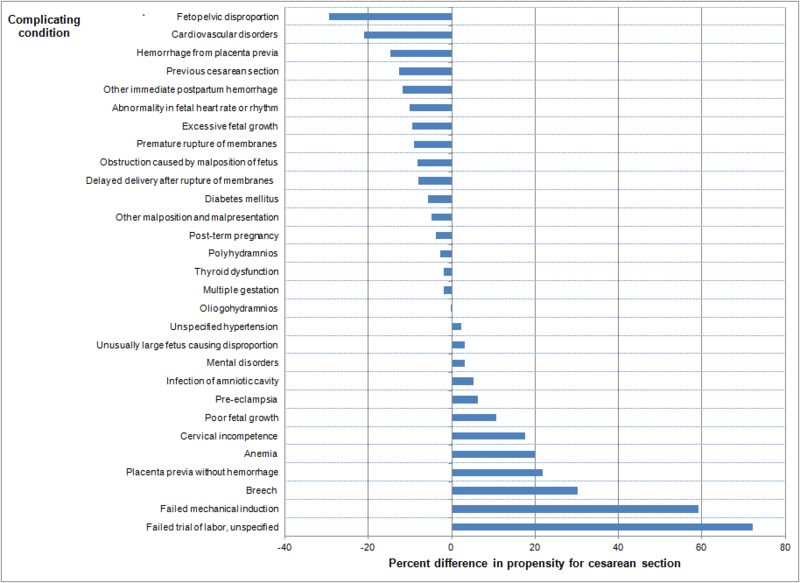 We also examined differences in prevalence rates among less common complicating conditions (see Appendix). Overall, there were very few differences in the rate of these conditions between Medicaid and private insurance for vaginal or cesarean section deliveries. There were two exceptions: thyroid dysfunction and delayed delivery after artificial rupture of membranes were each three times more common among private-payer discharges than among Medicaid-covered discharges for both types of deliveries. 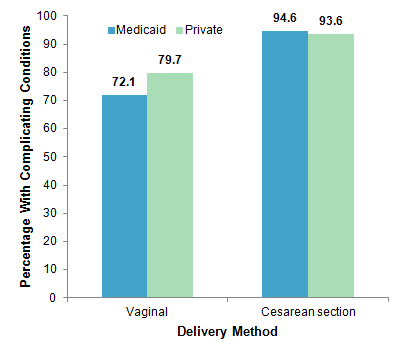 Figure 2 presents the percent difference in the propensity for having a cesarean section delivery for privately insured versus Medicaid-covered stays by complicating condition. Note: Principal and secondary diagnoses were examined. Conditions with a rate of at least 5 per 1000 for cesarean section delivery are shown. Figure 2. Propensity for cesarean section delivery, comparing privately insured versus Medicaid-covered deliveries by complicating condition. This is a tornado bar chart showing the type of complicating condition by the percent difference in propensity for cesarean section. Complicating condition: Fetopelvic disproportion: -29.43, Cardiovascular disorders: -20.97, Hemorrhage from placenta previa: -14.68, Previous cesarean section: -12.62, Other immediate postpartum hemorrhage: -11.79, Abnormality in fetal heart rate or rhythm: -10.12, Excessive fetal growth: -9.43, Premature rupture of membranes: -9.09, Obstruction caused by malposition of fetus: -8.12, Delayed delivery after rupture of membranes: -8.01, Diabetes mellitus: -5.75, Other malposition and malpresentation: -4.83, Post-term pregnancy: -3.83, Polyhydramnios: -2.63, Thyroid dysfunction: -1.95, Multiple gestation: -1.79, Oliogohydramnios: -0.25, Unspecified hypertension: 2.24, Unusually large fetus causing disproportion: 3.18, Mental disorders: 3.19, Infection of amniotic cavity: 5.29, Preeclampsia: 6.33, Poor fetal growth: 10.72, Cervical incompetence: 17.60, Anemia: 19.90, Placenta previa without hemorrhage: 21.78, Breech: 30.14, Failed mechanical induction: 59.12, Failed trial of labor, unspecified: 72.26. The estimates in this Statistical Brief are based upon data from the HCUP 2011 Nationwide Inpatient Sample (NIS). CCS categorizes ICD-9-CM diagnoses into a manageable number of clinically meaningful categories.10 This "clinical grouper" makes it easier to quickly understand patterns of diagnoses. CCS categories identified as "Other" typically are not reported; these categories include miscellaneous, otherwise unclassifiable diagnoses that may be difficult to interpret as a group. For the purpose of this Brief, "complicating conditions" includes selected ICD-9-CM diagnosis codes that are in the ICD-9-CM code section titled "Complications of Pregnancy, Childbirth, and the Puerperium. "11 The specific ICD-9-CM diagnosis codes used to identify each type of complicating condition are provided in Table 4. HCUP is based on data from community hospitals, which are defined as short-term, non-Federal, general, and other hospitals, excluding hospital units of other institutions (e.g., prisons). HCUP data include obstetrics and gynecology, otolaryngology, orthopedic, cancer, pediatric, public, and academic medical hospitals. Excluded are long-term care, rehabilitation, psychiatric, and alcoholism and chemical dependency hospitals. However, if a patient received long-term care, rehabilitation, or treatment for psychiatric or chemical dependency conditions in a community hospital, the discharge record for that stay will be included in the Nationwide Inpatient Sample (NIS). Total hospital charges were converted to costs using HCUP Cost-to-Charge Ratios based on hospital accounting reports from the Centers for Medicare & Medicaid Services (CMS).13 Costs will reflect the actual expenses incurred in the production of hospital services, such as wages, supplies, and utility costs; charges represent the amount a hospital billed for the case. For each hospital, a hospital-wide cost-to-charge ratio is used. Hospital charges reflect the amount the hospital billed for the entire hospital stay and do not include professional (physician) fees. For the purposes of this Statistical Brief, costs are reported to the nearest hundred. For this Statistical brief, approximately six percent of childbirth stays were from women who were uninsured or insured through Medicare or some other payer. These data were not included in the main sample (see additional information in Table 1). The HCUP Nationwide Inpatient Sample (NIS) is a nationwide database of hospital inpatient stays. The NIS is nationally representative of all community hospitals (i.e., short-term, non-Federal, nonrehabilitation hospitals). The NIS is a sample of hospitals and includes all patients from each hospital, regardless of payer. It is drawn from a sampling frame that contains hospitals comprising more than 95 percent of all discharges in the United States. The vast size of the NIS allows the study of topics at the national and regional levels for specific subgroups of patients. In addition, NIS data are standardized across years to facilitate ease of use. Introduction to the HCUP Nationwide Inpatient Sample, 2009. Online. May 2011. U.S. Agency for Healthcare Research and Quality. http://hcup-us.ahrq.gov/db/nation/nis/NIS_2009_INTRODUCTION.pdf. Accessed April 18, 2014. Houchens R, Elixhauser A. Final Report on Calculating Nationwide Inpatient Sample (NIS) Variances, 2001. HCUP Methods Series Report #2003-2. Online. June 2005 (revised June 6, 2005). U.S. Agency for Healthcare Research and Quality. http://www.hcup-us.ahrq.gov/reports/methods/2003_02.pdf. Accessed April 18, 2014. Moore JE (AHRQ), Witt WP (Truven Health Analytics), Elixhauser A (AHRQ). Complicating Conditions Associated With Childbirth, by Delivery Method and Payer, 2011. HCUP Statistical Brief #173. May 2014. Agency for Healthcare Research and Quality, Rockville, MD. http://www.hcup-us.ahrq.gov/reports/statbriefs/sb173-Childbirth-Delivery-Complications.pdf. The authors would like to acknowledge the contributions of Nils Nordstrand and Maris Watkins of Truven Health Analytics and of Joani Slager, DNP, CNM, CPC, FACNM of Bronson Healthcare. 1 Hall MJ, DeFrances CJ, Williams SN, Golosinskiy A, Schwartzman A. National Hospital Discharge Survey: 2007 Summary. Natlonal Health Statistics Report No. 29. Hyattsville, MD: National Center for Health Statistics; October 2010. 2 Podulka J, Stranges E, Steiner C. Hospitalizations Related to Childbirth, 2008. HCUP Statistical Brief #110. April 2011. Agency for Healthcare Research and Quality. Rockville, MD. 3 Stranges E, Wier LM, Elixhauser A. Complicating Conditions of Vaginal Deliveries and Cesarean Sections, 2009. HCUP Statistical Brief #131. May 2012. Agency for Healthcare Research and Quality. Rockville, MD. 4 Torio CM, Andrews RM. National Inpatient Hospital Costs: The Most Expensive Conditions by Payer, 2011. HCUP Statistical Brief #160. August 2013. Agency for Healthcare Research and Quality. Rockville, MD. 5 Rank order of major diagnostic category by aggregate costs, 2011. HCUPnet. Agency for Healthcare Research and Quality. Rockville, MD. https://hcupnet.ahrq.gov/#query/eyJBTkFMWVNJU19UWVBFIjpbIkFUX1IiXSwiT1VUQ09NRV9NRUFTVVJFUyI6WyJPTV9BQ09fUiJdLCJZRUFSUyI6WyJZUl8yMDExIl0sIkNBVEVHT1JJWkFUSU9OX1RZUEUiOlsiQ1RfTURDIl0sIkRBVEFTRVRfU09VUkNFIjpbIkRTX05JUyJdfQ==. Accessed April 18, 2018. 6 Curtin SC, Osterman MJ, Uddin SF, Sutton SR, Reed PR. Source of Payment for the Delivery: Births in a 33-State and District of Columbia Reporting Area, 2010. National Vital Statistics Reports, Vol. 62, No. 5. Hyattsville, MD: National Center for Health Statistics; December 2013. 7 Kozhimannil KB, Shippee TP, Adegoke O, Vemig BA. Trends in hospital-based childbirth care: the role of health insurance. Am J Manag Care. 2013 Apr;19(4):e125-32. 8 Heisler CA, Melton LJ, 3rd, Weaver AL, Gebhart JB. Determining perioperative complications associated with vaginal hysterectomy: code classification versus chart review. J Am Coll Surg. 2009 Jul;209(1):119-22. 9 Yasmeen S, Romano PS, Schembri ME, Keyzer JM, Gilbert WM. Accuracy of obstetric diagnoses and procedures in hospital discharge data. Am J Obstet Gynecol. 2006 Apr;194(4):992-1001. 10 HCUP Clinical Classifications Software (CCS). Healthcare Cost and Utilization Project (HCUP). U.S. Agency for Healthcare Research and Quality, Rockville, MD. Updated April 2014. http://www.hcup-us.ahrq.gov/toolssoftware/ccs/ccs.jsp. Accessed April 18, 2014. 11 Complications Mainly Related To Pregnancy (640-649); Normal Delivery and Other Indications for Care in Pregnancy, Labor, and Delivery (650-659); Complications Occurring Mainly in the Course of Labor and Delivery (660-669); and Complications of the Puerperium (670-677). See http://www.icd9data.com/2013/Volume1/630-679/default.htm. Accessed April 28, 2014. 12 The American College of Obstetricians and Gynecologists. Clinical Management Guidelines for Obstetricians and Gynecologists. Practice Bulletin; April 2014. http://www.acog.org/~/media/List%20of%20Titles/PBListOfTitles.pdf?dmc=1&ts=20140320T1329103747. Accessed April 1, 2014. 13 HCUP Cost-to-Charge Ratio Files (CCR). Healthcare Cost and Utilization Project (HCUP). 2001-2009. U.S. Agency for Healthcare Research and Quality, Rockville, MD. Updated August 2013. http://www.hcup-us.ahrq.gov/db/state/costtocharge.jsp. Accessed January 29, 2013. Internet Citation: Statistical Brief #173. Healthcare Cost and Utilization Project (HCUP). April 2018. Agency for Healthcare Research and Quality, Rockville, MD. www.hcup-us.ahrq.gov/reports/statbriefs/sb173-Childbirth-Delivery-Complications.jsp.